The Southeast Super Truck Series embarked on a new journey as they visited Caraway Speedway for the first time ever on Saturday July 28. The 0.455 mile facility located in Sophia, NC, has been known for producing some of the best open wheel modified races. The Super Truck teams rolled in early Saturday morning to take advantage of the early morning practice session. Only a few drivers have had experience at the famed track in other divisions, those being Clint King, Lee Tissot, Eddie Collins, and BJ Mackey. King, Tissot, and Mackey had competed in the former UARA Stars Late Model Series. It was no surprise to see Tissot the SEST Series three time champion, top the speed charts for the first round of practice, followed by Ashton Higgins and BJ Mackey. In the second round, it was former Series Champion Kenneth Headen who clawed his way to the top of the charts in the final practice. He was followed by King and Ashley Huffman. The teams headed back into the infield and through the tech inspection. Qualifying was up next for the drivers and teams. Ashley Huffman, and his Dwight Huffman Racing team captured the Renegade Race Fuels Pole Award. Huffman rolled a four on the invert dice and this now allowed Higgins to start from the captains seat. The trucks of Mackey and Headen pulled out of line after qualifying to make adjustments to their trucks and both would re-join the field at the tail end. Higgins, the youngster out of Weaverville, NC adapts quickly to every track the series visits and in any type of race vehicle. He followed the City Chevrolet pace truck around the track with Clint King starting on his outside. The green flag flew and Higgins took off like a bolt of lightening. King ducked in behind the #9 machine of Higgins and followed his tracks around the speedway. Lap 30 King was finally able to make a move and take over the top spot from Higgins. This also opened the doors for Tissot, Headen and Huffman as they worked their way past Higgins. King led the next seven laps, until Tissot was about to make the move and take over the lead. Tissot began to pull away and stretch the lead out over King. Headen and Huffman battled hard for the third position. The first and only caution flew on lap 64 as the #66 Bucket List Racing truck driven by Bennie Davis looped it around in turn one. Tissot paced the field back to the green flag with King on his outside for 11 more laps. Jamie Barbrey began applying heavy preasure to the back bumper of Higgins, to try and take over the fifth position. 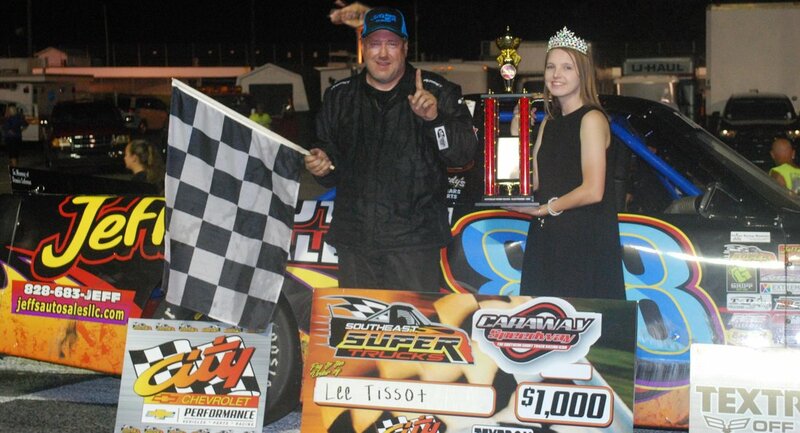 Tissot was able to capture the victory in the Inaugural Southeast Super Truck Series event at Caraway. "King took my hometrack win away a few years ago at Kingsport (in the UARA Late Model Race), and now Im taking his hometrack win away, always good to race with King" stated Tissot in a victory lane interview. "Running with Lee is always fun. He and I have ran with each other a lot and it's always a good battle. If we wouldn't have lost the brakes about halfway I believe the race for the win would have been a lot closer at the finish and he would have had some tough company in the closing laps" stated King. The Series will invade Anderson Motor Speedway one final time this year on August 18th, they will be joined by the Gripp Energy Limited Late Models, Southeast Legends Tour, Allison Legacy Series, Carolina Vintage Racers, and other division to be announced. Stay tuned to the SEST Series website, and of course our Soical Media sites. We will have a exciting announcement to make in the next few days about some of our upcoming races.